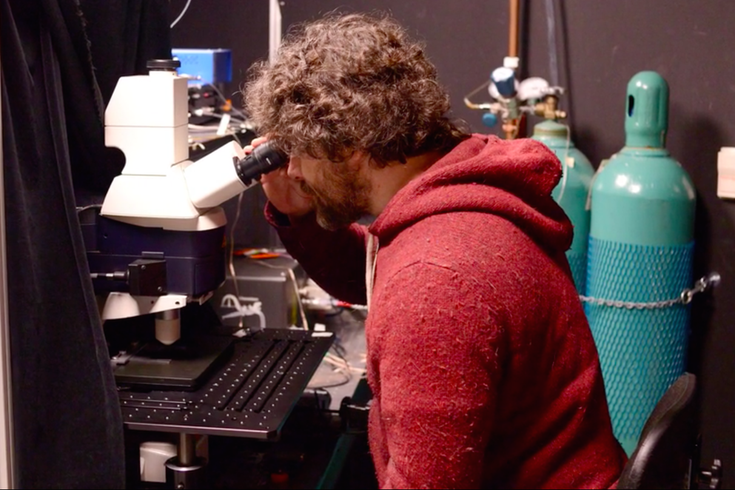 Researcher Christoph Konradt examines blood cells under a multi-photon microscope. Researchers at the University of Pennsylvania are unlocking how toxic infections move from the bloodstream to the brain. As Penn News reported, scientists at Penn's School of Veterinary Medicine and other institutions across the country used a high-tech imaging device called a multi-photon microscope to visualize how a parasite called Toxoplasma gondii breaks into the brain. "It’s something that no one had seen before,” professor Christopher Hunter told Penn News. Using special proteins that made the Toxoplasma parasite glow bright red and selected cells glow bright green, the researchers could track how the parasite moved into living tissue. They saw how the parasite infects cells that line blood vessels near or in the brain. The Toxoplasma reproduces inside a cell until it bursts, spraying the parasite into the brain. The study, published on Monday in Nature Microbiology, uncovered two crucial observations. First, only parasites that reproduced spread from the blood to other tissues. That suggests that scientists could fight the virus by creating a drug that stops replication. Second, a surprising number of parasites moved freely in the blood, able to infect other cells in the vein system. Still, almost all of these free parasites latched onto cells within 10 days, giving doctors an important clue into how much time they have to, for example, prevent a pregnant mother from spreading the parasite to her fetus. While the scientists focused on Toxoplasma, a parasite that's spread through cat feces, their research holds important implications for other infections like rabies, malaria or even the Zika virus.